The second largest city on the island of Crete is a charming blend of ancient history with modern development. 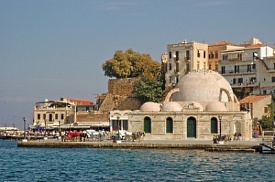 The Old Town is centered around the district of Kastelli, which has been inhabited since Neolithic times, and among the historic buildings of the harbor visitors can find a vibrant nightlife. The modern city beyond the old town is also bursting with things to do, from museums to public gardens to the busy market square. The summer is a particularly busy time of year, with festivals and other cultural events happening nearly every day.